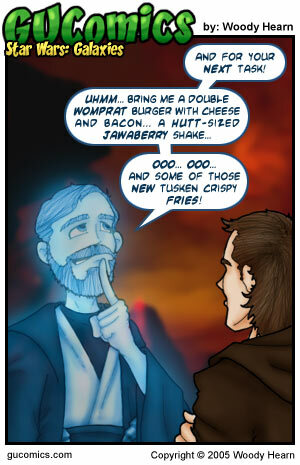 Star Wars: Galaxies: "Double Womprat Burger"
In Star Wars: Galaxies' upcoming expanion "Trials of Obi-Wan", the players carry out missions given by the spirit of the Old Ben. I figure, by that point, he'd been a blue glowie for a while... and was probably itching for some takeout. Not much more to discuss than that really. So, if you have something truly poignant to add, for the sake of conversation, please be my guest.